Never have I had such a battle. I've been over my ideal weight my whole life despite various bouts of fiendish exercise, and the fact I do eat pretty healthy, I've never felt exactly where I wanted to be. Which I'm ok with, but this year has been different. I was pretty o.l.d. when I had my third baby, and nursing (as always) saved me from having to diet at all to lose my baby weight (not that it happened fast). But this time, I quit nursing my little man when he was just over a year, and slowly but surely my weight crept up. What?! This never happened before. Then without notice, pretty much all my pants were too tight, I bought a bigger size. Then those got tight. Uh-oh. Something had to change. Not to mention my sugar addiction has kicked on full-force and literally after every meal (even breakfast!) I'm looking for something sweet or gummy or chocolatey. A few weeks ago I bought this simple cleanse at Costco. The flavors looked good, it was really inexpensive, and was only three days long. I've never done a cleanse before & thought this might be a great kick-start to healthier eating for me. I had to wait a while to start it because it requires no alcohol, sugar, animal products, or caffeine. I had to make sure I would be home for 3 days to do this cleanse because going out...anywhere...with all those restrictions is just depressing! But guess what, I LOVED it! 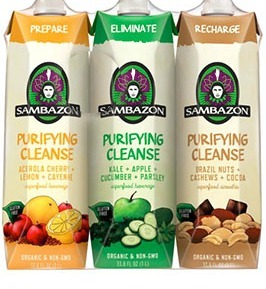 According to Sambazon's website, this "3-day purifying cleanse consists of three organic superfood beverages and a sensible meal plan designed by Dr. Oz health expert Ashley Koff, RD. The program helps prepare the body for renewal, eliminates toxins and recharges energy levels." The three drinks were each unique and satisfying. The a.m. drink, 'Prepare' was like lemonade with a cayenne kick. Then in the afternoons I'd have one or both of the chocolate+nut 'Recharge' or the kale+apple+cucumber drink 'Eliminate'. The green one wasn't my favorite, but I don't love green vegetables, so go figure. The cleanse came with a daily guide and recipe book of delicious vegan recipes to accompany the drinks. I honestly can say I ate well, didn't starve, and really didn't miss my old stand-by's (liquor, coffee, treats, dairy). Best part, it's day 4 and I'm not craving sugar! And I lost 4 pounds, but that could be water. I'm not becoming vegan, but I am going to incorporate some vegan meals into our family dining. I'm also going to go ahead with this cleanse each time I need a kick-start. It's available at Costco (not .com) for $14.95. It does look like they have a great energy drink available online here though. Go for a kick-start when things are off. Sometimes it helps to shake things up from the routine in order to get back on track. Sambazon doesn't know me. This is an honest review of a product I purchased myself.